Rowing can put pressure on the knee joint. Rowing, whether as part of a rowing team, on an occasional weekend outing or with a rowing machine, provides both cardiovascular exercise and strength training in both your upper and lower body. You can paddle your way to strong muscles and better heart health in only a few months -- and because rowing is often a group activity, it's an ideal chance to meet new friends. But some rowers experience knee pain, particularly when they're new to the sport, and this pain can quickly make rowing and other fitness activities impossible. When you move your paddle downward, you begin moving your knee through your full range of motion. Over time, this can help strengthen your knee joint, but if you use too much force, you can quickly end up in a lot of pain. When you move your paddle downward, your knee joint is completely flexed, and this stroke is especially likely to cause pain and exacerbate preexisting injuries. 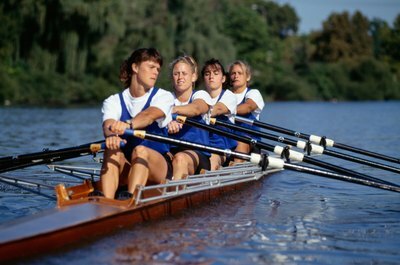 Some rowing-related knee pain is just a case of delayed-onset muscle soreness, a kind of muscle pain that develops 12 to 72 hours after exercise; it usually gets better on its own as you strengthen your muscles and joints. But more serious injuries can include sprains and strains, as well as problems with your iliotibial band -- commonly called the ITB band -- which glides across the knee joint. Sometimes rowers experience painful clicking as the ITB band moves. Muscle imbalances and weaknesses can also be a problem; if you tend to exert more force on or with one knee more than the other, you may end up with pain, tingling or weakness in either knee. Rest, ice, compression and elevation can help to ease the pain of almost any injury. Non-steroidal anti-inflammatory drugs not only ease pain, they also reduce swelling. But if pain gets worse or is severe, you may need to see your doctor. Serious muscle injuries could require physical therapy, medication or surgery, and your doctor might refer you to a chiropractor, soft tissue specialist or physical therapist. While you may be tempted to get back to your enjoyable outdoor workout as soon as possible, avoid returning to rowing until the pain subsides, or you could end up with a much more serious injury. If there were a surefire recipe to prevent rowing injuries, there wouldn't be so many rowers with aching knees. Instead, you'll have to try several different strategies until you find one that works for you. 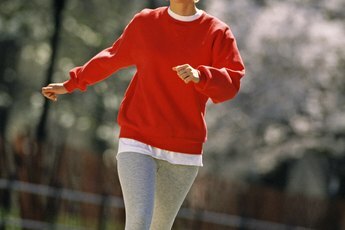 The American Council on Exercise reports that stretching can help reduce the risk of delayed onset muscle soreness. Stretching also improves joint mobility and muscle flexibility, so it can help reduce your risk of generalized pain and serious injuries. Proper form is also key. Avoid exerting more effort with one side of your body or leaning while you're rowing. If you have a chronic condition such as arthritis, talk to your doctor before you take up rowing. Muscle-strengthening activities, such as squats and lunges, can help you gradually build knee strength and reduce your risk of knee pain.